Definition at line 28 of file AMDGPUISelLowering.h. Definition at line 310 of file AMDGPUISelLowering.h. Definition at line 142 of file AMDGPUISelLowering.cpp. References llvm::ISD::ADD, llvm::ISD::ADDC, llvm::ISD::ADDE, llvm::TargetLoweringBase::AddPromotedToType(), llvm::ISD::AND, llvm::ISD::AssertSext, llvm::ISD::AssertZext, llvm::ISD::BITCAST, llvm::ISD::BR_JT, llvm::ISD::BRIND, llvm::ISD::BSWAP, llvm::ISD::CONCAT_VECTORS, llvm::ISD::Constant, llvm::ISD::ConstantFP, llvm::ISD::CTLZ, llvm::ISD::CTLZ_ZERO_UNDEF, llvm::ISD::CTPOP, llvm::ISD::CTTZ, llvm::ISD::CTTZ_ZERO_UNDEF, llvm::TargetLoweringBase::Custom, llvm::ISD::DYNAMIC_STACKALLOC, llvm::TargetLoweringBase::Expand, llvm::ISD::EXTLOAD, llvm::ISD::EXTRACT_SUBVECTOR, llvm::MVT::f16, llvm::MVT::f32, llvm::MVT::f64, llvm::ISD::FABS, llvm::ISD::FADD, llvm::ISD::FCANONICALIZE, llvm::ISD::FCEIL, llvm::ISD::FCOPYSIGN, llvm::ISD::FCOS, llvm::ISD::FDIV, llvm::ISD::FEXP, llvm::ISD::FEXP2, llvm::ISD::FFLOOR, llvm::ISD::FLOG, llvm::ISD::FLOG10, llvm::ISD::FLOG2, llvm::ISD::FMA, llvm::ISD::FMAXNUM, llvm::ISD::FMINNUM, llvm::ISD::FMUL, llvm::ISD::FNEARBYINT, llvm::ISD::FNEG, llvm::ISD::FP16_TO_FP, llvm::ISD::FP_TO_FP16, llvm::ISD::FP_TO_SINT, llvm::ISD::FP_TO_UINT, llvm::ISD::FPOW, llvm::ISD::FREM, llvm::ISD::FRINT, llvm::ISD::FROUND, llvm::ISD::FSIN, llvm::ISD::FSQRT, llvm::ISD::FSUB, llvm::ISD::FTRUNC, llvm::TargetLoweringBase::GatherAllAliasesMaxDepth, I, llvm::MVT::i1, llvm::MVT::i16, llvm::MVT::i32, llvm::MVT::i64, llvm::MVT::i8, llvm::MVT::integer_valuetypes(), llvm::MVT::integer_vector_valuetypes(), llvm::TargetLoweringBase::Legal, LLVM_READNONE, llvm::ISD::LOAD, llvm::TargetLoweringBase::MaxStoresPerMemcpy, llvm::TargetLoweringBase::MaxStoresPerMemmove, llvm::TargetLoweringBase::MaxStoresPerMemset, llvm::ISD::MUL, llvm::ISD::MULHS, llvm::ISD::MULHU, llvm::ISD::OR, llvm::MVT::Other, llvm::TargetLoweringBase::PredictableSelectIsExpensive, llvm::TargetLoweringBase::Promote, llvm::Sched::RegPressure, llvm::ISD::ROTL, llvm::ISD::ROTR, llvm::ISD::SDIV, llvm::ISD::SDIVREM, llvm::ISD::SELECT, llvm::ISD::SELECT_CC, llvm::TargetLoweringBase::setBooleanContents(), llvm::TargetLoweringBase::setBooleanVectorContents(), llvm::ISD::SETCC, llvm::TargetLoweringBase::setHasMultipleConditionRegisters(), llvm::TargetLoweringBase::setJumpIsExpensive(), llvm::TargetLoweringBase::setLibcallName(), llvm::TargetLoweringBase::setLoadExtAction(), llvm::TargetLoweringBase::setOperationAction(), llvm::TargetLoweringBase::setSchedulingPreference(), llvm::TargetLoweringBase::setTargetDAGCombine(), llvm::TargetLoweringBase::setTruncStoreAction(), llvm::ISD::SEXTLOAD, llvm::ISD::SHL, llvm::ISD::SINT_TO_FP, llvm::ISD::SMAX, llvm::ISD::SMIN, llvm::ISD::SMUL_LOHI, llvm::ISD::SRA, llvm::ISD::SREM, llvm::ISD::SRL, llvm::ISD::STORE, llvm::ISD::SUB, llvm::ISD::SUBC, llvm::ISD::SUBE, llvm::ISD::TRUNCATE, llvm::ISD::UDIV, llvm::ISD::UDIVREM, llvm::ISD::UINT_TO_FP, llvm::ISD::UMAX, llvm::ISD::UMIN, llvm::ISD::UMUL_LOHI, llvm::ISD::UREM, llvm::MVT::v16f32, llvm::MVT::v16i32, llvm::MVT::v2f16, llvm::MVT::v2f32, llvm::MVT::v2f64, llvm::MVT::v2i1, llvm::MVT::v2i16, llvm::MVT::v2i32, llvm::MVT::v2i64, llvm::MVT::v2i8, llvm::MVT::v3f32, llvm::MVT::v3i32, llvm::MVT::v4f16, llvm::MVT::v4f32, llvm::MVT::v4f64, llvm::MVT::v4i16, llvm::MVT::v4i32, llvm::MVT::v4i8, llvm::MVT::v5f32, llvm::MVT::v5i32, llvm::MVT::v8f16, llvm::MVT::v8f32, llvm::MVT::v8f64, llvm::MVT::v8i32, llvm::ISD::VECTOR_SHUFFLE, llvm::ISD::VSELECT, llvm::ISD::XOR, llvm::TargetLoweringBase::ZeroOrNegativeOneBooleanContent, and llvm::ISD::ZEXTLOAD. Definition at line 1084 of file AMDGPUISelLowering.cpp. References llvm::SelectionDAG::getEntryNode(), llvm::SDValue::getNode(), llvm::SelectionDAG::getNode(), llvm::MachineFrameInfo::getObjectOffset(), llvm::MachineFrameInfo::getObjectSize(), llvm::MVT::Other, llvm::SmallVectorTemplateBase< T >::push_back(), llvm::ISD::TokenFactor, llvm::SDNode::use_begin(), and llvm::SDNode::use_end(). Referenced by llvm::SITargetLowering::LowerCall(), and stripBitcast(). Definition at line 802 of file AMDGPUISelLowering.cpp. Definition at line 634 of file AMDGPUISelLowering.cpp. References llvm::EVT::getScalarType(), llvm::EVT::getSimpleVT(), llvm::SDNode::getValueType(), hasSourceMods(), opMustUseVOP3Encoding(), and llvm::SDNode::uses(). Referenced by isClampZeroToOne(), performFNegCombine(), and stripBitcast(). The SelectionDAGBuilder will automatically promote function arguments with illegal types. 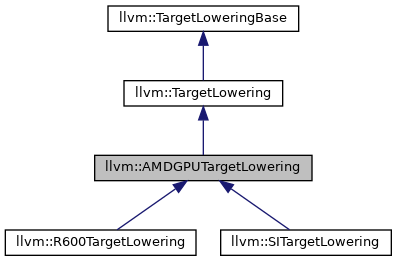 However, this does not work for the AMDGPU targets since the function arguments are stored in memory as these illegal types. In order to handle this properly we need to get the original types sizes from the LLVM IR Function and fixup the ISD:InputArg values before passing them to AnalyzeFormalArguments() When the SelectionDAGBuilder computes the Ins, it takes care of splitting input values across multiple registers. Each item in the Ins array represents a single value that will be stored in registers. Ins[x].VT is the value type of the value that will be stored in the register, so whatever SDNode we lower the argument to needs to be this type. In order to correctly lower the arguments we need to know the size of each argument. Since Ins[x].VT gives us the size of the register that will hold the value, we need to look at Ins[x].ArgVT to see the 'real' type for the orignal function argument so that we can deduce the correct memory type to use for Ins[x]. In most cases the correct memory type will be Ins[x].ArgVT. However, this will not always be the case. If, for example, we have a kernel argument of type v8i8, this argument will be split into 8 parts and each part will be represented by its own item in the Ins array. For each part the Ins[x].ArgVT will be the v8i8, which is the full type of the argument before it was split. From this, we deduce that the memory type for each individual part is i8. We pass the memory type as LocVT to the calling convention analysis function and the register type (Ins[x].VT) as the ValVT. Definition at line 946 of file AMDGPUISelLowering.cpp. References llvm::CCState::addLoc(), llvm::AMDGPU::HSAMD::Kernel::Arg::Key::Align, llvm::alignTo(), Arg, llvm::Function::args(), assert(), llvm::ComputeValueVTs(), llvm::CCValAssign::Full, llvm::AMDGPUSubtarget::get(), llvm::DataLayout::getABITypeAlignment(), llvm::Function::getCallingConv(), llvm::Module::getContext(), llvm::CCState::getContext(), llvm::CCValAssign::getCustomMem(), llvm::Module::getDataLayout(), llvm::AMDGPUSubtarget::getExplicitKernelArgOffset(), llvm::MachineFunction::getFunction(), llvm::EVT::getIntegerVT(), llvm::CCState::getMachineFunction(), llvm::TargetLoweringBase::getNumRegistersForCallingConv(), llvm::GlobalValue::getParent(), llvm::EVT::getPow2VectorType(), llvm::TargetLoweringBase::getRegisterTypeForCallingConv(), llvm::EVT::getScalarType(), llvm::MVT::getScalarType(), llvm::EVT::getSimpleVT(), llvm::EVT::getStoreSize(), llvm::EVT::getStoreSizeInBits(), llvm::DataLayout::getTypeAllocSize(), llvm::EVT::getVectorNumElements(), llvm::MVT::getVectorNumElements(), llvm::EVT::getVectorVT(), llvm::EVT::isExtended(), llvm::MVT::isFloatingPoint(), llvm::MVT::isInteger(), llvm::EVT::isPow2VectorType(), llvm::EVT::isVector(), llvm::MVT::isVector(), llvm_unreachable, llvm::max(), llvm::SmallVectorBase::size(), and llvm::ARM_MB::ST.
Referenced by llvm::R600TargetLowering::LowerFormalArguments(), and llvm::SITargetLowering::LowerFormalArguments(). Definition at line 1074 of file AMDGPUISelLowering.cpp. Referenced by llvm::SITargetLowering::isEligibleForTailCallOptimization(), llvm::SITargetLowering::LowerCall(), llvm::SITargetLowering::LowerFormalArguments(), and stripBitcast(). Definition at line 1079 of file AMDGPUISelLowering.cpp. Referenced by llvm::SITargetLowering::CanLowerReturn(), llvm::SITargetLowering::LowerCallResult(), llvm::SITargetLowering::LowerReturn(), and stripBitcast(). Definition at line 1297 of file AMDGPUISelLowering.cpp. References llvm::AfterLegalizeDAG, llvm::TargetLowering::DAGCombinerInfo::DAG, llvm::AMDGPUISD::FMAX_LEGACY, llvm::AMDGPUISD::FMIN_LEGACY, llvm::TargetLowering::DAGCombinerInfo::getDAGCombineLevel(), llvm::SelectionDAG::getNode(), llvm::TargetLowering::DAGCombinerInfo::isCalledByLegalizer(), llvm_unreachable, llvm::ISD::SETCC_INVALID, llvm::ISD::SETEQ, llvm::ISD::SETFALSE, llvm::ISD::SETFALSE2, llvm::ISD::SETGE, llvm::ISD::SETGT, llvm::ISD::SETLE, llvm::ISD::SETLT, llvm::ISD::SETNE, llvm::ISD::SETO, llvm::ISD::SETOEQ, llvm::ISD::SETOGE, llvm::ISD::SETOGT, llvm::ISD::SETOLE, llvm::ISD::SETOLT, llvm::ISD::SETONE, llvm::ISD::SETTRUE, llvm::ISD::SETTRUE2, llvm::ISD::SETUEQ, llvm::ISD::SETUGE, llvm::ISD::SETUGT, llvm::ISD::SETULE, llvm::ISD::SETULT, llvm::ISD::SETUNE, and llvm::ISD::SETUO. Referenced by performSelectCombine(), llvm::R600TargetLowering::ReplaceNodeResults(), and stripBitcast(). Determine which of the bits specified in Mask are known to be either zero or one and return them in the KnownZero and KnownOne bitsets. Definition at line 4400 of file AMDGPUISelLowering.cpp. References llvm::AMDGPUISD::BFE_I32, llvm::AMDGPUISD::BFE_U32, llvm::AMDGPUISD::BORROW, llvm::AMDGPUISD::BUFFER_LOAD_UBYTE, llvm::AMDGPUISD::BUFFER_LOAD_USHORT, llvm::AMDGPUISD::CARRY, llvm::SelectionDAG::computeKnownBits(), llvm::KnownBits::countMinLeadingZeros(), llvm::KnownBits::countMinSignBits(), llvm::KnownBits::countMinTrailingZeros(), llvm::dyn_cast(), llvm::AMDGPUISD::FP16_ZEXT, llvm::AMDGPUISD::FP_TO_FP16, llvm::KnownBits::getBitWidth(), llvm::APInt::getHighBitsSet(), llvm::SelectionDAG::getMachineFunction(), llvm::SDValue::getOpcode(), llvm::SDValue::getOperand(), llvm::EVT::getSizeInBits(), llvm::MachineFunction::getSubtarget(), llvm::SDValue::getValueType(), llvm::GCNSubtarget::getWavefrontSizeLog2(), llvm::ConstantSDNode::getZExtValue(), llvm::APInt::getZExtValue(), I, llvm::ISD::INTRINSIC_WO_CHAIN, llvm::KnownBits::isNegative(), llvm::KnownBits::isNonNegative(), llvm::AMDGPUISD::MUL_I24, llvm::AMDGPUISD::MUL_U24, llvm::KnownBits::One, llvm::AMDGPUISD::PERM, llvm::KnownBits::resetAll(), llvm::APInt::setHighBits(), llvm::APInt::setLowBits(), Size, llvm::ARM_MB::ST, llvm::KnownBits::trunc(), and llvm::KnownBits::Zero. This method can be implemented by targets that want to expose additional information about sign bits to the DAG Combiner. The DemandedElts argument allows us to only collect the minimum sign bits that are shared by the requested vector elements. Definition at line 4533 of file AMDGPUISelLowering.cpp. References llvm::AMDGPUISD::BFE_I32, llvm::AMDGPUISD::BFE_U32, llvm::AMDGPUISD::BORROW, llvm::AMDGPUISD::BUFFER_LOAD_BYTE, llvm::AMDGPUISD::BUFFER_LOAD_SHORT, llvm::AMDGPUISD::BUFFER_LOAD_UBYTE, llvm::AMDGPUISD::BUFFER_LOAD_USHORT, llvm::AMDGPUISD::CARRY, llvm::SelectionDAG::ComputeNumSignBits(), llvm::dyn_cast(), llvm::AMDGPUISD::FP16_ZEXT, llvm::AMDGPUISD::FP_TO_FP16, llvm::SDValue::getOpcode(), llvm::SDValue::getOperand(), llvm::ConstantSDNode::getZExtValue(), llvm::isNullConstant(), and llvm::max(). Helper function that adds Reg to the LiveIn list of the DAG's MachineFunction. a RegisterSDNode representing Reg if RawReg is true, otherwise a copy from the register. Definition at line 4118 of file AMDGPUISelLowering.cpp. References llvm::MachineRegisterInfo::addLiveIn(), llvm::MachineRegisterInfo::createVirtualRegister(), llvm::SelectionDAG::getCopyFromReg(), llvm::SelectionDAG::getEntryNode(), llvm::MachineRegisterInfo::getLiveInVirtReg(), llvm::SelectionDAG::getMachineFunction(), llvm::MachineFunction::getRegInfo(), llvm::SelectionDAG::getRegister(), llvm::MachineRegisterInfo::isLiveIn(), and MRI. Referenced by CreateLiveInRegister(), CreateLiveInRegisterRaw(), findUser(), isFsqrtCheap(), llvm::SITargetLowering::isTypeDesirableForOp(), loadInputValue(), llvm::SITargetLowering::LowerCall(), and llvm::SITargetLowering::LowerReturn(). Definition at line 279 of file AMDGPUISelLowering.h. Definition at line 286 of file AMDGPUISelLowering.h. References Arg, CreateLiveInRegister(), llvm::SelectionDAG::getEntryNode(), loadInputValue(), loadStackInputValue(), and storeStackInputValue(). Definition at line 119 of file AMDGPUISelLowering.cpp. References assert(), llvm::EVT::getIntegerVT(), llvm::EVT::getStoreSizeInBits(), llvm::EVT::getVectorVT(), and llvm::MVT::i32. Referenced by isClampZeroToOne(), performLoadCombine(), performStoreCombine(), and llvm::SITargetLowering::ReplaceNodeResults(). TODO: Let fence operands be of i32 type and remove this. Definition at line 321 of file AMDGPUISelLowering.h. Definition at line 1393 of file AMDGPUISelLowering.cpp. References llvm::ISD::BITCAST, llvm::ISD::EXTRACT_VECTOR_ELT, llvm::SelectionDAG::getConstant(), llvm::SelectionDAG::getNode(), llvm::MVT::i32, and llvm::MVT::v2i32. Definition at line 4181 of file AMDGPUISelLowering.cpp. References llvm::alignTo(), llvm::AMDGPUSubtarget::get(), llvm::AMDGPUMachineFunction::getExplicitKernArgSize(), llvm::AMDGPUSubtarget::getExplicitKernelArgOffset(), llvm::MachineFunction::getFunction(), llvm::MachineFunction::getInfo(), llvm::TargetLoweringBase::getTargetMachine(), GRID_DIM, GRID_OFFSET, llvm_unreachable, and llvm::ARM_MB::ST.
Referenced by llvm::SITargetLowering::isTypeDesirableForOp(), and llvm::R600TargetLowering::LowerOperation(). Definition at line 1385 of file AMDGPUISelLowering.cpp. Enabled is a ReciprocalEstimate enum with value either 'Unspecified' or 'Enabled' as set by a potential default override attribute. If RefinementSteps is 'Unspecified', the number of Newton-Raphson refinement iterations required to generate a sufficient (though not necessarily IEEE-754 compliant) estimate is returned in that parameter. A target may choose to implement its own refinement within this function. If that's true, then return '0' as the number of RefinementSteps to avoid any further refinement of the estimate. An empty SDValue return means no estimate sequence can be created. Definition at line 4379 of file AMDGPUISelLowering.cpp. References llvm::MVT::f32, llvm::SelectionDAG::getNode(), llvm::SDValue::getValueType(), and llvm::AMDGPUISD::RCP. The first part is a power of two vector. The second part is whatever is left over, and is a scalar if it would otherwise be a 1-vector. Definition at line 1405 of file AMDGPUISelLowering.cpp. References llvm::SelectionDAG::getContext(), llvm::EVT::getVectorElementType(), llvm::EVT::getVectorNumElements(), llvm::EVT::getVectorVT(), and llvm::PowerOf2Ceil(). Referenced by SplitVectorLoad(), and SplitVectorStore(). Return either a square root or its reciprocal estimate value for the input operand. Enabled is a ReciprocalEstimate enum with value either 'Unspecified' or 'Enabled' as set by a potential default override attribute. If RefinementSteps is 'Unspecified', the number of Newton-Raphson refinement iterations required to generate a sufficient (though not necessarily IEEE-754 compliant) estimate is returned in that parameter. The boolean UseOneConstNR output is used to select a Newton-Raphson algorithm implementation that uses either one or two constants. The boolean Reciprocal is used to select whether the estimate is for the square root of the input operand or the reciprocal of its square root. A target may choose to implement its own refinement within this function. If that's true, then return '0' as the number of RefinementSteps to avoid any further refinement of the estimate. An empty SDValue return means no estimate sequence can be created. Definition at line 4361 of file AMDGPUISelLowering.cpp. References llvm::MVT::f32, llvm::SelectionDAG::getNode(), llvm::SDValue::getValueType(), and llvm::AMDGPUISD::RSQ. Definition at line 4201 of file AMDGPUISelLowering.cpp. References llvm::ISD::ATOMIC_CMP_SWAP, llvm::AMDGPUISD::ATOMIC_DEC, llvm::AMDGPUISD::ATOMIC_INC, llvm::AMDGPUISD::ATOMIC_LOAD_FMAX, llvm::AMDGPUISD::ATOMIC_LOAD_FMIN, llvm::AMDGPUISD::BFE_I32, llvm::AMDGPUISD::BFE_U32, llvm::AMDGPUISD::BFI, llvm::AMDGPUISD::BFM, llvm::AMDGPUISD::BORROW, llvm::AMDGPUISD::BRANCH_COND, llvm::AMDGPUISD::BUFFER_ATOMIC_ADD, llvm::AMDGPUISD::BUFFER_ATOMIC_AND, llvm::AMDGPUISD::BUFFER_ATOMIC_CMPSWAP, llvm::AMDGPUISD::BUFFER_ATOMIC_OR, llvm::AMDGPUISD::BUFFER_ATOMIC_SMAX, llvm::AMDGPUISD::BUFFER_ATOMIC_SMIN, llvm::AMDGPUISD::BUFFER_ATOMIC_SUB, llvm::AMDGPUISD::BUFFER_ATOMIC_SWAP, llvm::AMDGPUISD::BUFFER_ATOMIC_UMAX, llvm::AMDGPUISD::BUFFER_ATOMIC_UMIN, llvm::AMDGPUISD::BUFFER_ATOMIC_XOR, llvm::AMDGPUISD::BUFFER_LOAD, llvm::AMDGPUISD::BUFFER_LOAD_BYTE, llvm::AMDGPUISD::BUFFER_LOAD_FORMAT, llvm::AMDGPUISD::BUFFER_LOAD_FORMAT_D16, llvm::AMDGPUISD::BUFFER_LOAD_SHORT, llvm::AMDGPUISD::BUFFER_LOAD_UBYTE, llvm::AMDGPUISD::BUFFER_LOAD_USHORT, llvm::AMDGPUISD::BUFFER_STORE, llvm::AMDGPUISD::BUFFER_STORE_BYTE, llvm::AMDGPUISD::BUFFER_STORE_FORMAT, llvm::AMDGPUISD::BUFFER_STORE_FORMAT_D16, llvm::AMDGPUISD::BUFFER_STORE_SHORT, llvm::AMDGPUISD::BUILD_VERTICAL_VECTOR, llvm::AArch64ISD::CALL, llvm::AMDGPUISD::CARRY, llvm::AMDGPUISD::CLAMP, llvm::AMDGPUISD::CONST_ADDRESS, llvm::AMDGPUISD::CONST_DATA_PTR, llvm::AMDGPUISD::COS_HW, llvm::AMDGPUISD::CVT_F32_UBYTE0, llvm::AMDGPUISD::CVT_F32_UBYTE1, llvm::AMDGPUISD::CVT_F32_UBYTE2, llvm::AMDGPUISD::CVT_F32_UBYTE3, llvm::AMDGPUISD::CVT_PK_I16_I32, llvm::AMDGPUISD::CVT_PK_U16_U32, llvm::AMDGPUISD::CVT_PKNORM_I16_F32, llvm::AMDGPUISD::CVT_PKNORM_U16_F32, llvm::AMDGPUISD::CVT_PKRTZ_F16_F32, llvm::AMDGPUISD::DIV_FIXUP, llvm::AMDGPUISD::DIV_FMAS, llvm::AMDGPUISD::DIV_SCALE, llvm::AMDGPUISD::DOT4, llvm::AMDGPUISD::DS_ORDERED_COUNT, llvm::AMDGPUISD::DUMMY_CHAIN, llvm::AMDGPUISD::DWORDADDR, llvm::AMDGPUISD::ELSE, llvm::AMDGPUISD::ENDPGM, llvm::AMDGPUISD::EXPORT, llvm::AMDGPUISD::EXPORT_DONE, llvm::AMDGPUISD::FDOT2, llvm::AMDGPUISD::FFBH_I32, llvm::AMDGPUISD::FFBH_U32, llvm::AMDGPUISD::FFBL_B32, llvm::AMDGPUISD::FIRST_MEM_OPCODE_NUMBER, llvm::AMDGPUISD::FIRST_NUMBER, llvm::AMDGPUISD::FMA_W_CHAIN, llvm::AMDGPUISD::FMAD_FTZ, llvm::AMDGPUISD::FMAX3, llvm::AMDGPUISD::FMAX_LEGACY, llvm::AMDGPUISD::FMED3, llvm::AMDGPUISD::FMIN3, llvm::AMDGPUISD::FMIN_LEGACY, llvm::AMDGPUISD::FMUL_LEGACY, llvm::AMDGPUISD::FMUL_W_CHAIN, llvm::AMDGPUISD::FP16_ZEXT, llvm::AMDGPUISD::FP_CLASS, llvm::ISD::FP_TO_FP16, llvm::AMDGPUISD::FRACT, llvm::AMDGPUISD::IF, llvm::AMDGPUISD::INIT_EXEC, llvm::AMDGPUISD::INIT_EXEC_FROM_INPUT, llvm::AMDGPUISD::INTERP_MOV, llvm::AMDGPUISD::INTERP_P1, llvm::AMDGPUISD::INTERP_P1LL_F16, llvm::AMDGPUISD::INTERP_P1LV_F16, llvm::AMDGPUISD::INTERP_P2, llvm::AMDGPUISD::INTERP_P2_F16, llvm::AMDGPUISD::KILL, llvm::AMDGPUISD::LAST_AMDGPU_ISD_NUMBER, llvm::AMDGPUISD::LDEXP, llvm::AMDGPUISD::LOAD_CONSTANT, llvm::AMDGPUISD::LOAD_D16_HI, llvm::AMDGPUISD::LOAD_D16_HI_I8, llvm::AMDGPUISD::LOAD_D16_HI_U8, llvm::AMDGPUISD::LOAD_D16_LO, llvm::AMDGPUISD::LOAD_D16_LO_I8, llvm::AMDGPUISD::LOAD_D16_LO_U8, llvm::AMDGPUISD::LOOP, llvm::AMDGPUISD::MAD_I24, llvm::AMDGPUISD::MAD_I64_I32, llvm::AMDGPUISD::MAD_U24, llvm::AMDGPUISD::MAD_U64_U32, llvm::AMDGPUISD::MUL_I24, llvm::AMDGPUISD::MUL_LOHI_I24, llvm::AMDGPUISD::MUL_LOHI_U24, llvm::AMDGPUISD::MUL_U24, llvm::AMDGPUISD::MULHI_I24, llvm::AMDGPUISD::MULHI_U24, NODE_NAME_CASE, llvm::AMDGPUISD::PC_ADD_REL_OFFSET, llvm::AMDGPUISD::PERM, llvm::AMDGPUISD::R600_EXPORT, llvm::AMDGPUISD::RCP, llvm::AMDGPUISD::RCP_IFLAG, llvm::AMDGPUISD::RCP_LEGACY, llvm::AMDGPUISD::REGISTER_LOAD, llvm::AMDGPUISD::REGISTER_STORE, llvm::AArch64ISD::RET_FLAG, llvm::AMDGPUISD::RETURN_TO_EPILOG, llvm::AMDGPUISD::RSQ, llvm::AMDGPUISD::RSQ_CLAMP, llvm::AMDGPUISD::RSQ_LEGACY, llvm::AMDGPUISD::SAMPLE, llvm::AMDGPUISD::SAMPLEB, llvm::AMDGPUISD::SAMPLED, llvm::AMDGPUISD::SAMPLEL, llvm::AMDGPUISD::SBUFFER_LOAD, llvm::AMDGPUISD::SENDMSG, llvm::AMDGPUISD::SENDMSGHALT, llvm::ISD::SETCC, llvm::AMDGPUISD::SETREG, llvm::AMDGPUISD::SIN_HW, llvm::AMDGPUISD::SMAX3, llvm::AMDGPUISD::SMED3, llvm::AMDGPUISD::SMIN3, llvm::AMDGPUISD::STORE_MSKOR, llvm::AMDGPUISD::TBUFFER_LOAD_FORMAT, llvm::AMDGPUISD::TBUFFER_LOAD_FORMAT_D16, llvm::AMDGPUISD::TBUFFER_STORE_FORMAT, llvm::AMDGPUISD::TBUFFER_STORE_FORMAT_D16, llvm::AArch64ISD::TC_RETURN, llvm::AMDGPUISD::TEXTURE_FETCH, llvm::ISD::TRAP, llvm::AMDGPUISD::TRIG_PREOP, llvm::AMDGPUISD::UMAX3, llvm::AMDGPUISD::UMED3, llvm::AMDGPUISD::UMIN3, llvm::AMDGPUISD::UMUL, and llvm::AMDGPUISD::URECIP. Returns the type to be used for the index operand of: ISD::INSERT_VECTOR_ELT, ISD::EXTRACT_VECTOR_ELT, ISD::INSERT_SUBVECTOR, and ISD::EXTRACT_SUBVECTOR. Definition at line 658 of file AMDGPUISelLowering.cpp. Referenced by llvm::R600TargetLowering::ReplaceNodeResults(), splitVector(), SplitVectorLoad(), stripBitcast(), and WidenVectorLoad(). Definition at line 742 of file AMDGPUISelLowering.cpp. Definition at line 738 of file AMDGPUISelLowering.cpp. Definition at line 3634 of file AMDGPUISelLowering.cpp. References C, llvm::AMDGPUSubtarget::hasInv2PiInlineImm(), llvm::isConstOrConstSplatFP(), and isInv2Pi(). Return true if an fabs operation is free to the point where it is never worthwhile to replace it with a bitwise operation. Definition at line 781 of file AMDGPUISelLowering.cpp. References assert(), llvm::MVT::f16, llvm::MVT::f32, llvm::MVT::f64, llvm::AMDGPUSubtarget::has16BitInsts(), and llvm::EVT::isFloatingPoint(). Return true if an fneg operation is free to the point where it is never worthwhile to replace it with a bitwise operation. Definition at line 789 of file AMDGPUISelLowering.cpp. References assert(), llvm::MVT::f16, llvm::MVT::f32, llvm::MVT::f64, llvm::AMDGPUSubtarget::has16BitInsts(), llvm::AMDGPUSubtarget::hasVOP3PInsts(), llvm::EVT::isFloatingPoint(), and llvm::MVT::v2f16. If false, the legalizer will materialize the FP immediate as a load from a constant pool. Definition at line 668 of file AMDGPUISelLowering.cpp. References llvm::MVT::f16, llvm::MVT::f32, llvm::MVT::f64, llvm::EVT::getScalarType(), and llvm::AMDGPUSubtarget::has16BitInsts(). Return true if SQRT(X) shouldn't be replaced with X*RSQRT(X). Definition at line 239 of file AMDGPUISelLowering.h. References computeKnownBitsForTargetNode(), ComputeNumSignBitsForTargetNode(), CreateLiveInRegister(), llvm::Depth, llvm::TargetLoweringBase::Enabled, getRecipEstimate(), getSqrtEstimate(), isKnownNeverNaNForTargetNode(), PostISelFolding(), and Reg. true if Op is known to never be any NaN. If sNaN is true, returns if Op is known to never be a signaling NaN. Definition at line 4575 of file AMDGPUISelLowering.cpp. References llvm::AMDGPUISD::COS_HW, llvm::AMDGPUISD::CVT_F32_UBYTE0, llvm::AMDGPUISD::CVT_F32_UBYTE1, llvm::AMDGPUISD::CVT_F32_UBYTE2, llvm::AMDGPUISD::CVT_F32_UBYTE3, llvm::AMDGPUISD::CVT_PKRTZ_F16_F32, llvm::AMDGPUISD::DIV_FIXUP, llvm::AMDGPUISD::DIV_FMAS, llvm::AMDGPUISD::DIV_SCALE, llvm::AMDGPUISD::FMAD_FTZ, llvm::AMDGPUISD::FMAX3, llvm::AMDGPUISD::FMAX_LEGACY, llvm::AMDGPUISD::FMED3, llvm::AMDGPUISD::FMIN3, llvm::AMDGPUISD::FMIN_LEGACY, llvm::AMDGPUISD::FMUL_LEGACY, llvm::AMDGPUISD::FRACT, llvm::SDValue::getOpcode(), llvm::SDValue::getOperand(), llvm::ISD::INTRINSIC_WO_CHAIN, llvm::SelectionDAG::isKnownNeverNaN(), llvm::AMDGPUISD::LDEXP, llvm::AMDGPUISD::RCP, llvm::AMDGPUISD::RCP_LEGACY, llvm::AMDGPUISD::RSQ, llvm::AMDGPUISD::RSQ_CLAMP, llvm::AMDGPUISD::RSQ_LEGACY, llvm::AMDGPUISD::SIN_HW, and llvm::AMDGPUISD::TRIG_PREOP. Referenced by isFsqrtCheap(), and llvm::SITargetLowering::isKnownNeverNaNForTargetNode(). Return true if the following transform is beneficial: fold (conv (load x)) -> (load (conv*)x) On architectures that don't natively support some vector loads efficiently, casting the load to a smaller vector of larger types and loading is more efficient, however, this can be undone by optimizations in dag combiner. Definition at line 719 of file AMDGPUISelLowering.cpp. References assert(), llvm::EVT::getScalarSizeInBits(), llvm::EVT::getScalarType(), llvm::EVT::getSizeInBits(), and llvm::MVT::i32. Return true if it's profitable to narrow operations of type VT1 to VT2. e.g. on x86, it's profitable to narrow from i32 to i8 but not from i32 to i16. Definition at line 861 of file AMDGPUISelLowering.cpp. Definition at line 746 of file AMDGPUISelLowering.cpp. References AMDGPUAS::CONSTANT_ADDRESS_32BIT, llvm::dyn_cast(), llvm::ISD::EntryToken, llvm::MachineMemOperand::getAddrSpace(), llvm::MemSDNode::getMemOperand(), llvm::SDNode::getOpcode(), llvm::SDNode::getOperand(), llvm::ISD::INTRINSIC_WO_CHAIN, llvm::ISD::LOAD, N, and llvm::ISD::TokenFactor. Definition at line 662 of file AMDGPUISelLowering.cpp. Definition at line 814 of file AMDGPUISelLowering.cpp. Return true if it's free to truncate a value of type FromTy to type ToTy. e.g. On x86 it's free to truncate a i32 value in register EAX to i16 by referencing its sub-register AX. Targets must return false when FromTy <= ToTy. Definition at line 823 of file AMDGPUISelLowering.cpp. Return true if any actual instruction that defines a value of type FromTy implicitly zero-extends the value to ToTy in the result register. The function should return true when it is likely that the truncate can be freely folded with an instruction defining a value of FromTy. If the defining instruction is unknown (because you're looking at a function argument, PHI, etc.) then the target may require an explicit truncate, which is not necessarily free, but this function does not deal with those cases. Targets must return false when FromTy >= ToTy. Definition at line 835 of file AMDGPUISelLowering.cpp. Referenced by isZExtFree(), and stripBitcast(). Definition at line 845 of file AMDGPUISelLowering.cpp. References llvm::MVT::i16, llvm::MVT::i32, and llvm::MVT::i64. Definition at line 857 of file AMDGPUISelLowering.cpp. Definition at line 4170 of file AMDGPUISelLowering.cpp. References assert(), CreateLiveInRegister(), llvm::ArgDescriptor::getRegister(), llvm::ArgDescriptor::getStackOffset(), llvm::ArgDescriptor::isRegister(), and loadStackInputValue(). Referenced by CreateLiveInRegisterRaw(), parseTexFail(), and llvm::SITargetLowering::passSpecialInputs(). Similar to CreateLiveInRegister, except value maybe loaded from a stack slot rather than passed in a register. Definition at line 4140 of file AMDGPUISelLowering.cpp. References llvm::MachineFrameInfo::CreateFixedObject(), llvm::SelectionDAG::getEntryNode(), llvm::SelectionDAG::getFrameIndex(), llvm::MachineFunction::getFrameInfo(), llvm::SelectionDAG::getLoad(), llvm::SelectionDAG::getMachineFunction(), llvm::MachinePointerInfo::getStack(), llvm::EVT::getStoreSize(), llvm::MVT::i32, llvm::MachineMemOperand::MODereferenceable, and llvm::MachineMemOperand::MOInvariant. Referenced by CreateLiveInRegisterRaw(), and loadInputValue(). The outgoing arguments to the call are described by the Outs array, and the values to be returned by the call are described by the Ins array. The implementation should fill in the InVals array with legal-type return values from the call, and return the resulting token chain value. Definition at line 1147 of file AMDGPUISelLowering.cpp. Definition at line 1264 of file AMDGPUISelLowering.cpp. References llvm::AMDGPU::HSAMD::Kernel::Key::Args, llvm::ISD::BITCAST, llvm::SelectionDAG::ExtractVectorElements(), llvm::SelectionDAG::getBuildVector(), llvm::SelectionDAG::getNode(), llvm::SDValue::getOperand(), llvm::SDValue::getValueType(), llvm::MipsISD::Hi, llvm::MVT::i32, llvm::MipsISD::Lo, llvm::SDNode::ops(), llvm::MVT::v2i32, llvm::MVT::v4f16, and llvm::MVT::v4i16. Definition at line 2370 of file AMDGPUISelLowering.cpp. References llvm::MCID::Add, llvm::ISD::ADD, llvm::ISD::AND, llvm::ISD::BITCAST, llvm::ISD::CTLZ_ZERO_UNDEF, llvm::ISD::CTTZ_ZERO_UNDEF, llvm::ISD::EXTRACT_VECTOR_ELT, llvm::AMDGPUISD::FFBH_U32, llvm::AMDGPUISD::FFBL_B32, llvm::SelectionDAG::getConstant(), llvm::SelectionDAG::getContext(), llvm::SelectionDAG::getDataLayout(), llvm::SelectionDAG::getNode(), llvm::SDValue::getOpcode(), llvm::SDValue::getOperand(), llvm::SelectionDAG::getSetCC(), llvm::TargetLoweringBase::getSetCCResultType(), llvm::SDValue::getValueType(), llvm::MipsISD::Hi, llvm::MVT::i32, llvm::MVT::i64, isCtlzOpc(), isCttzOpc(), llvm_unreachable, llvm::MipsISD::Lo, llvm::ISD::SELECT, llvm::ISD::SETEQ, llvm::MVT::v2i32, and llvm::ISD::ZERO_EXTEND. Definition at line 1564 of file AMDGPUISelLowering.cpp. References llvm::ISD::ADD, llvm::ISD::AND, llvm::SelectionDAG::ComputeNumSignBits(), llvm::MVT::f32, llvm::ISD::FABS, llvm::ISD::FMAD, llvm::AMDGPUISD::FMAD_FTZ, llvm::ISD::FMUL, llvm::ISD::FNEG, llvm::ISD::FP_TO_SINT, llvm::ISD::FP_TO_UINT, llvm::ISD::FTRUNC, llvm::SelectionDAG::getConstant(), llvm::SelectionDAG::getContext(), llvm::SelectionDAG::getDataLayout(), llvm::EVT::getIntegerVT(), llvm::SelectionDAG::getMergeValues(), llvm::SelectionDAG::getNode(), llvm::SDValue::getOperand(), llvm::SelectionDAG::getSetCC(), llvm::TargetLoweringBase::getSetCCResultType(), llvm::EVT::getSizeInBits(), llvm::SDValue::getValueType(), llvm::SelectionDAG::getValueType(), llvm::AMDGPUSubtarget::hasFP32Denormals(), llvm::MVT::i32, llvm::ARM_AM::ia, llvm::ARM_AM::ib, llvm::ISD::MUL, llvm::ISD::OR, llvm::AMDGPUISD::RCP, llvm::ISD::SELECT, llvm::ISD::SETOGE, llvm::ISD::SIGN_EXTEND_INREG, llvm::ISD::SINT_TO_FP, llvm::ISD::SRA, llvm::ISD::SUB, llvm::ISD::UINT_TO_FP, and llvm::ISD::XOR. Referenced by LowerSDIVREM(), and LowerUDIVREM(). Definition at line 1152 of file AMDGPUISelLowering.cpp. References llvm::LLVMContext::diagnose(), llvm::SelectionDAG::getConstant(), llvm::SelectionDAG::getContext(), getDebugLoc(), llvm::MachineFunction::getFunction(), llvm::SelectionDAG::getMachineFunction(), llvm::SelectionDAG::getMergeValues(), llvm::SDValue::getOperand(), and llvm::SDValue::getValueType(). Referenced by LowerOperation(), and stripBitcast(). Definition at line 1284 of file AMDGPUISelLowering.cpp. Definition at line 2071 of file AMDGPUISelLowering.cpp. References llvm::MCID::Add, llvm::ISD::AND, llvm::MVT::f64, llvm::ISD::FADD, llvm::ISD::FTRUNC, llvm::SelectionDAG::getConstantFP(), llvm::SelectionDAG::getContext(), llvm::SelectionDAG::getDataLayout(), llvm::SelectionDAG::getNode(), llvm::SDValue::getOperand(), llvm::SelectionDAG::getSetCC(), llvm::TargetLoweringBase::getSetCCResultType(), llvm::ISD::SELECT, llvm::ISD::SETOGT, and llvm::ISD::SETONE. Definition at line 2352 of file AMDGPUISelLowering.cpp. References llvm::ISD::FEXP2, llvm::ISD::FMUL, llvm::SDNode::getFlags(), getLog2EVal(), llvm::SelectionDAG::getNode(), llvm::SDValue::getOperand(), and llvm::SDValue::getValueType(). Definition at line 2297 of file AMDGPUISelLowering.cpp. References llvm::MCID::Add, llvm::ISD::AND, llvm::MVT::f64, llvm::ISD::FADD, llvm::ISD::FTRUNC, llvm::SelectionDAG::getConstantFP(), llvm::SelectionDAG::getContext(), llvm::SelectionDAG::getDataLayout(), llvm::SelectionDAG::getNode(), llvm::SDValue::getOperand(), llvm::SelectionDAG::getSetCC(), llvm::TargetLoweringBase::getSetCCResultType(), llvm::ISD::SELECT, llvm::ISD::SETOLT, and llvm::ISD::SETONE. Definition at line 2322 of file AMDGPUISelLowering.cpp. References llvm::ISD::FLOG2, llvm::ISD::FMUL, llvm::SelectionDAG::getConstantFP(), llvm::SelectionDAG::getNode(), llvm::SDValue::getOperand(), and llvm::SDValue::getValueType(). Definition at line 2187 of file AMDGPUISelLowering.cpp. References llvm::ISD::FRINT, llvm::SelectionDAG::getNode(), llvm::SDValue::getOperand(), and llvm::SDValue::getValueType(). Definition at line 2606 of file AMDGPUISelLowering.cpp. References llvm::ISD::BITCAST, llvm::BitsToDouble(), llvm::MVT::f64, llvm::ISD::FFLOOR, llvm::ISD::FMA, llvm::ISD::FMUL, llvm::ISD::FP_TO_SINT, llvm::ISD::FP_TO_UINT, llvm::ISD::FTRUNC, llvm::SelectionDAG::getBuildVector(), llvm::SelectionDAG::getConstantFP(), llvm::SelectionDAG::getNode(), llvm::SDValue::getOperand(), llvm::MipsISD::Hi, llvm::MVT::i32, llvm::MVT::i64, llvm::MipsISD::Lo, and llvm::MVT::v2i32. Referenced by LowerFP_TO_SINT(), and LowerFP_TO_UINT(). Definition at line 2635 of file AMDGPUISelLowering.cpp. References llvm::ISD::ADD, llvm::ISD::AND, assert(), B, llvm::ISD::BITCAST, D, E, llvm::MVT::f32, llvm::MVT::f64, llvm::AMDGPUISD::FP_TO_FP16, llvm::SelectionDAG::getConstant(), llvm::SelectionDAG::getNode(), llvm::SDValue::getOperand(), llvm::SelectionDAG::getSelectCC(), llvm::SDValue::getSimpleValueType(), llvm::TargetLoweringBase::getTargetMachine(), llvm::SDValue::getValueType(), llvm::SelectionDAG::getZExtOrTrunc(), I, llvm::MVT::i32, llvm::MVT::i64, N, llvm::TargetMachine::Options, llvm::ISD::OR, llvm::ISD::SETEQ, llvm::ISD::SETGT, llvm::ISD::SETLT, llvm::ISD::SETNE, llvm::ISD::SHL, llvm::ISD::SMAX, llvm::ISD::SMIN, llvm::ISD::SRL, llvm::ISD::SUB, and llvm::TargetOptions::UnsafeFPMath. Definition at line 2734 of file AMDGPUISelLowering.cpp. References llvm::MVT::f16, llvm::MVT::f32, llvm::MVT::f64, llvm::ISD::FP_EXTEND, llvm::SelectionDAG::getNode(), llvm::SDValue::getOpcode(), llvm::SDValue::getOperand(), llvm::SDValue::getValueType(), llvm::AMDGPUSubtarget::has16BitInsts(), llvm::MVT::i64, and LowerFP64_TO_INT(). Definition at line 2757 of file AMDGPUISelLowering.cpp. Definition at line 2056 of file AMDGPUISelLowering.cpp. References llvm::ISD::FDIV, llvm::ISD::FMUL, llvm::ISD::FSUB, llvm::ISD::FTRUNC, llvm::SelectionDAG::getNode(), llvm::SDValue::getOperand(), llvm::SDValue::getValueType(), X, and Y. Definition at line 2160 of file AMDGPUISelLowering.cpp. References assert(), llvm::MVT::f64, llvm::ISD::FABS, llvm::ISD::FADD, llvm::ISD::FCOPYSIGN, llvm::ISD::FSUB, llvm::SelectionDAG::getConstantFP(), llvm::SelectionDAG::getContext(), llvm::SelectionDAG::getDataLayout(), llvm::SelectionDAG::getNode(), llvm::SDValue::getOperand(), llvm::SelectionDAG::getSelect(), llvm::SelectionDAG::getSetCC(), llvm::TargetLoweringBase::getSetCCResultType(), llvm::SDValue::getValueType(), llvm::APFloatBase::IEEEdouble(), and llvm::ISD::SETOGT. Definition at line 2285 of file AMDGPUISelLowering.cpp. References llvm::MVT::f16, llvm::MVT::f32, llvm::MVT::f64, llvm::SDValue::getValueType(), llvm_unreachable, LowerFROUND32_16(), and LowerFROUND64(). Definition at line 2199 of file AMDGPUISelLowering.cpp. References llvm::ISD::FABS, llvm::ISD::FADD, llvm::ISD::FCOPYSIGN, llvm::ISD::FSUB, llvm::ISD::FTRUNC, llvm::SelectionDAG::getConstantFP(), llvm::SelectionDAG::getContext(), llvm::SelectionDAG::getDataLayout(), llvm::SelectionDAG::getNode(), llvm::SDValue::getOperand(), llvm::SelectionDAG::getSetCC(), llvm::TargetLoweringBase::getSetCCResultType(), llvm::SDValue::getValueType(), llvm::ISD::SELECT, llvm::ISD::SETOGE, and X. Definition at line 2228 of file AMDGPUISelLowering.cpp. References llvm::ISD::ADD, llvm::ISD::AND, llvm::ISD::BITCAST, D, llvm::ISD::EXTRACT_VECTOR_ELT, extractF64Exponent(), llvm::MVT::f64, llvm::ISD::FCOPYSIGN, llvm::SelectionDAG::getConstant(), llvm::SelectionDAG::getConstantFP(), llvm::SelectionDAG::getContext(), llvm::SelectionDAG::getDataLayout(), llvm::SelectionDAG::getNode(), llvm::SelectionDAG::getNOT(), llvm::SDValue::getOperand(), llvm::SelectionDAG::getSetCC(), llvm::TargetLoweringBase::getSetCCResultType(), llvm::MipsISD::Hi, llvm::MVT::i32, llvm::MVT::i64, llvm::BitmaskEnumDetail::Mask(), llvm::ISD::SELECT, llvm::ISD::SETEQ, llvm::ISD::SETGT, llvm::ISD::SETLT, llvm::ISD::SETNE, llvm::ISD::SRA, llvm::MVT::v2i32, and X. Definition at line 2111 of file AMDGPUISelLowering.cpp. References llvm::ISD::AND, assert(), llvm::ISD::BITCAST, llvm::ISD::EXTRACT_VECTOR_ELT, extractF64Exponent(), llvm::MVT::f64, llvm::SelectionDAG::getBuildVector(), llvm::SelectionDAG::getConstant(), llvm::SelectionDAG::getContext(), llvm::SelectionDAG::getDataLayout(), llvm::SelectionDAG::getNode(), llvm::SelectionDAG::getNOT(), llvm::SDValue::getOperand(), llvm::SelectionDAG::getSetCC(), llvm::TargetLoweringBase::getSetCCResultType(), llvm::SDValue::getValueType(), llvm::MipsISD::Hi, llvm::MVT::i32, llvm::MVT::i64, llvm::ISD::SELECT, llvm::ISD::SETGT, llvm::ISD::SETLT, llvm::ISD::SRA, and llvm::MVT::v2i32. Definition at line 1229 of file AMDGPUISelLowering.cpp. References llvm::AMDGPUMachineFunction::allocateLDSGlobal(), assert(), llvm::LLVMContext::diagnose(), G, llvm::GlobalAddressSDNode::getAddressSpace(), llvm::SelectionDAG::getConstant(), llvm::SelectionDAG::getContext(), llvm::SelectionDAG::getDataLayout(), getDebugLoc(), llvm::MachineFunction::getFunction(), llvm::GlobalAddressSDNode::getGlobal(), llvm::SelectionDAG::getMachineFunction(), llvm::GlobalAddressSDNode::getOffset(), llvm::SDValue::getValueType(), hasDefinedInitializer(), llvm::AMDGPUMachineFunction::isEntryFunction(), AMDGPUAS::LOCAL_ADDRESS, and AMDGPUAS::REGION_ADDRESS. Referenced by buildPCRelGlobalAddress(), and llvm::R600TargetLowering::ReplaceNodeResults(). Definition at line 2444 of file AMDGPUISelLowering.cpp. References llvm::ISD::ADD, llvm::ISD::AND, llvm::ISD::BITCAST, C, llvm::ISD::CTLZ_ZERO_UNDEF, E, llvm::MVT::f32, llvm::ISD::FNEG, llvm::SelectionDAG::getConstant(), llvm::SelectionDAG::getContext(), llvm::SelectionDAG::getDataLayout(), llvm::SelectionDAG::getNode(), llvm::SDValue::getOperand(), llvm::SelectionDAG::getSelect(), llvm::SelectionDAG::getSetCC(), llvm::TargetLoweringBase::getSetCCResultType(), llvm::SelectionDAG::getSExtOrTrunc(), llvm::MVT::i32, llvm::MVT::i64, llvm::ISD::OR, llvm::ISD::SETEQ, llvm::ISD::SETNE, llvm::ISD::SETUGT, llvm::ISD::SHL, llvm::ISD::SRA, llvm::ISD::SRL, llvm::ISD::SUB, llvm::ISD::TRUNCATE, and llvm::ISD::XOR. Referenced by LowerSINT_TO_FP(), and LowerUINT_TO_FP(). Definition at line 2529 of file AMDGPUISelLowering.cpp. References llvm::ISD::BITCAST, llvm::ISD::EXTRACT_VECTOR_ELT, llvm::MVT::f64, llvm::ISD::FADD, llvm::SelectionDAG::getConstant(), llvm::SelectionDAG::getNode(), llvm::SDValue::getOperand(), llvm::MipsISD::Hi, llvm::MVT::i32, llvm::AMDGPUISD::LDEXP, llvm::MipsISD::Lo, llvm::ISD::SINT_TO_FP, llvm::ISD::UINT_TO_FP, and llvm::MVT::v2i32. 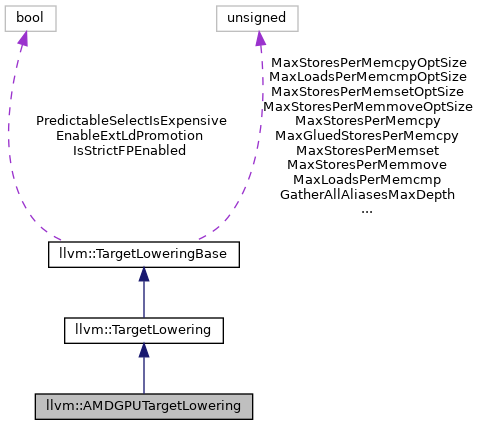 Reimplemented in llvm::SITargetLowering, and llvm::R600TargetLowering. Definition at line 1163 of file AMDGPUISelLowering.cpp. References AMDGPU_LN10_F, AMDGPU_LN2_F, AMDGPU_LOG2E_F, llvm::ISD::CONCAT_VECTORS, llvm::ISD::CTLZ, llvm::ISD::CTLZ_ZERO_UNDEF, llvm::ISD::CTTZ, llvm::ISD::CTTZ_ZERO_UNDEF, llvm::ISD::DYNAMIC_STACKALLOC, llvm::errs(), llvm::ISD::EXTRACT_SUBVECTOR, llvm::ISD::FCEIL, llvm::ISD::FEXP, llvm::ISD::FFLOOR, llvm::ISD::FLOG, llvm::ISD::FLOG10, llvm::ISD::FNEARBYINT, llvm::ISD::FP_TO_FP16, llvm::ISD::FP_TO_SINT, llvm::ISD::FP_TO_UINT, llvm::ISD::FREM, llvm::ISD::FRINT, llvm::ISD::FROUND, llvm::ISD::FTRUNC, llvm::SDValue::getOpcode(), llvm_unreachable, LowerCONCAT_VECTORS(), LowerCTLZ_CTTZ(), LowerDYNAMIC_STACKALLOC(), LowerEXTRACT_SUBVECTOR(), LowerFCEIL(), lowerFEXP(), LowerFFLOOR(), LowerFLOG(), LowerFNEARBYINT(), LowerFP_TO_FP16(), LowerFP_TO_SINT(), LowerFP_TO_UINT(), LowerFREM(), LowerFRINT(), LowerFROUND(), LowerFTRUNC(), LowerSDIVREM(), LowerSIGN_EXTEND_INREG(), LowerSINT_TO_FP(), LowerUDIVREM(), LowerUINT_TO_FP(), llvm::SDNode::print(), llvm::ISD::SDIVREM, llvm::ISD::SIGN_EXTEND_INREG, llvm::ISD::SINT_TO_FP, llvm::ISD::UDIVREM, and llvm::ISD::UINT_TO_FP. Referenced by llvm::R600TargetLowering::LowerOperation(), llvm::SITargetLowering::LowerOperation(), and stripBitcast(). This hook must be implemented to lower outgoing return values, described by the Outs array, into the specified DAG. The implementation should return the resulting token chain value. Definition at line 1057 of file AMDGPUISelLowering.cpp. References llvm::AMDGPUISD::ENDPGM, llvm::SelectionDAG::getNode(), and llvm::MVT::Other. Referenced by llvm::SITargetLowering::LowerReturn(), and stripBitcast(). Definition at line 1995 of file AMDGPUISelLowering.cpp. References llvm::ISD::ADD, llvm::SelectionDAG::ComputeNumSignBits(), llvm::ISD::EXTRACT_ELEMENT, llvm::SelectionDAG::getConstant(), llvm::SelectionDAG::getContext(), llvm::EVT::getHalfSizedIntegerVT(), llvm::SelectionDAG::getMergeValues(), llvm::SelectionDAG::getNode(), llvm::SDValue::getOperand(), llvm::SelectionDAG::getSelectCC(), llvm::SDValue::getValue(), llvm::SDValue::getValueType(), llvm::SelectionDAG::getVTList(), llvm::MVT::i32, llvm::MVT::i64, LowerDIVREM24(), llvm::ISD::SDIVREM, llvm::ISD::SETLT, llvm::ISD::SIGN_EXTEND, llvm::ISD::SUB, llvm::ISD::UDIVREM, and llvm::ISD::XOR. Referenced by LowerOperation(), and llvm::R600TargetLowering::ReplaceNodeResults(). Definition at line 2780 of file AMDGPUISelLowering.cpp. References llvm::AMDGPU::HSAMD::Kernel::Key::Args, assert(), llvm::SelectionDAG::ExtractVectorElements(), llvm::SelectionDAG::getBuildVector(), llvm::SelectionDAG::getNode(), llvm::SDValue::getOperand(), llvm::EVT::getScalarType(), llvm::MVT::getScalarType(), llvm::SDValue::getSimpleValueType(), llvm::SelectionDAG::getValueType(), llvm::MVT::getVectorNumElements(), I, llvm::MVT::isVector(), and llvm::ISD::SIGN_EXTEND_INREG. Definition at line 2579 of file AMDGPUISelLowering.cpp. References assert(), llvm::MVT::f16, llvm::MVT::f32, llvm::MVT::f64, llvm::ISD::FP_ROUND, llvm::SelectionDAG::getIntPtrConstant(), llvm::SelectionDAG::getNode(), llvm::SDValue::getOpcode(), llvm::SDValue::getOperand(), llvm::SDValue::getValueType(), llvm::AMDGPUSubtarget::has16BitInsts(), llvm::MVT::i64, LowerINT_TO_FP32(), and LowerINT_TO_FP64(). Definition at line 1880 of file AMDGPUISelLowering.cpp. References llvm::ISD::ADD, llvm::ISD::AND, E, llvm::SelectionDAG::getConstant(), llvm::SelectionDAG::getMergeValues(), llvm::SelectionDAG::getNode(), llvm::SDValue::getOperand(), llvm::SelectionDAG::getSelectCC(), llvm::SDValue::getValueType(), llvm::MVT::i32, llvm::MVT::i64, LowerDIVREM24(), LowerUDIVREM64(), llvm::ISD::MUL, llvm::ISD::MULHU, llvm::AMDGPUISD::RCP, Results, llvm::ISD::SETEQ, llvm::ISD::SETUGE, llvm::ISD::SUB, and llvm::AMDGPUISD::URECIP. Definition at line 1670 of file AMDGPUISelLowering.cpp. References llvm::ISD::ADD, llvm::ISD::ADDCARRY, llvm::ISD::AND, assert(), llvm::AArch64ISD::BIT, llvm::ISD::BITCAST, llvm::ISD::EXTRACT_ELEMENT, llvm::MVT::f32, llvm::ISD::FMAD, llvm::AMDGPUISD::FMAD_FTZ, llvm::ISD::FMUL, llvm::ISD::FP_TO_UINT, llvm::ISD::FTRUNC, llvm::SelectionDAG::getBitcast(), llvm::SelectionDAG::getBuildVector(), llvm::SelectionDAG::getConstant(), llvm::SelectionDAG::getConstantFP(), llvm::SelectionDAG::getContext(), llvm::EVT::getHalfSizedIntegerVT(), llvm::APInt::getHighBitsSet(), llvm::SelectionDAG::getNode(), llvm::SDValue::getOperand(), llvm::SelectionDAG::getSelectCC(), llvm::EVT::getSizeInBits(), llvm::SDValue::getValue(), llvm::SDValue::getValueType(), llvm::SelectionDAG::getVTList(), llvm::AMDGPUSubtarget::hasFP32Denormals(), llvm::MVT::i1, llvm::MVT::i64, llvm::TargetLoweringBase::isTypeLegal(), llvm::SelectionDAG::MaskedValueIsZero(), llvm::ISD::MUL, llvm::ISD::MULHU, llvm::ISD::OR, llvm::SmallVectorTemplateBase< T >::push_back(), llvm::AMDGPUISD::RCP, llvm::ISD::SETEQ, llvm::ISD::SETNE, llvm::ISD::SETUGE, llvm::ISD::SHL, llvm::ISD::SRL, llvm::ISD::SUB, llvm::ISD::SUBCARRY, llvm::ISD::UDIV, llvm::ISD::UDIVREM, llvm::ISD::UINT_TO_FP, llvm::ISD::UREM, llvm::MVT::v2i32, and llvm::ISD::ZERO_EXTEND. Referenced by LowerUDIVREM(), and llvm::R600TargetLowering::ReplaceNodeResults(). Definition at line 2552 of file AMDGPUISelLowering.cpp. Definition at line 1120 of file AMDGPUISelLowering.cpp. References Callee, llvm::TargetLowering::CallLoweringInfo::Callee, llvm::TargetLowering::CallLoweringInfo::DAG, llvm::LLVMContext::diagnose(), llvm::TargetLowering::CallLoweringInfo::DL, E, G, llvm::SelectionDAG::getContext(), llvm::SDLoc::getDebugLoc(), llvm::SelectionDAG::getEntryNode(), llvm::MachineFunction::getFunction(), llvm::SelectionDAG::getMachineFunction(), llvm::SelectionDAG::getUNDEF(), I, llvm::TargetLowering::CallLoweringInfo::Ins, llvm::TargetLowering::CallLoweringInfo::IsTailCall, and llvm::SmallVectorTemplateBase< T >::push_back(). Referenced by LowerCall(), llvm::SITargetLowering::LowerCall(), and stripBitcast(). Definition at line 147 of file AMDGPUISelLowering.h. References llvm::SDNode::getFlags(), llvm::SDValue::getNode(), llvm::TargetLoweringBase::getTargetMachine(), and llvm::SDNodeFlags::hasNoSignedZeros(). This may catch stores that do not exist earlier (eg, stores created from intrinsics). Definition at line 237 of file AMDGPUISelLowering.h. Definition at line 134 of file AMDGPUISelLowering.cpp. References llvm::SelectionDAG::ComputeNumSignBits(), llvm::EVT::getSizeInBits(), and llvm::SDValue::getValueType(). Referenced by getMad64_32(), and isI24(). Definition at line 128 of file AMDGPUISelLowering.cpp. References llvm::SelectionDAG::computeKnownBits(), llvm::KnownBits::countMinLeadingZeros(), llvm::EVT::getSizeInBits(), and llvm::SDValue::getValueType(). Referenced by getMad64_32(), and isU24(). Definition at line 2998 of file AMDGPUISelLowering.cpp. References llvm::EVT::bitsGE(), llvm::TargetLowering::DAGCombinerInfo::DAG, llvm::SelectionDAG::getNode(), llvm::SDValue::getOpcode(), llvm::SDNode::getOpcode(), llvm::SDValue::getOperand(), llvm::SDNode::getOperand(), llvm::SDValue::getValueType(), llvm::SDNode::getValueType(), and llvm::ISD::TRUNCATE. Definition at line 3457 of file AMDGPUISelLowering.cpp. References llvm::TargetLowering::DAGCombinerInfo::DAG, llvm::dyn_cast(), llvm::AMDGPUISD::FFBH_U32, llvm::AMDGPUISD::FFBL_B32, llvm::SDValue::getOpcode(), llvm::SDValue::getOperand(), isCtlzOpc(), isCttzOpc(), isNegativeOne(), llvm::ConstantSDNode::isNullValue(), llvm::ISD::SETEQ, and llvm::ISD::SETNE. Definition at line 3904 of file AMDGPUISelLowering.cpp. References llvm::AfterLegalizeDAG, assert(), llvm::ISD::AssertSext, llvm::ISD::AssertZext, llvm::AMDGPUISD::BFE_I32, llvm::AMDGPUISD::BFE_U32, llvm::ISD::BITCAST, llvm::ISD::BUILD_VECTOR, C, llvm::TargetLowering::DAGCombinerInfo::CommitTargetLoweringOpt(), llvm::SelectionDAG::ComputeNumSignBits(), llvm::TargetLowering::DAGCombinerInfo::DAG, llvm::dyn_cast(), E, llvm::ISD::FABS, llvm::ISD::FNEG, llvm::APInt::getBitsSet(), llvm::SelectionDAG::getBuildVector(), llvm::SelectionDAG::getConstant(), llvm::SelectionDAG::getContext(), llvm::TargetLowering::DAGCombinerInfo::getDAGCombineLevel(), llvm::EVT::getIntegerVT(), llvm::SelectionDAG::getNode(), llvm::SDValue::getOpcode(), llvm::SDNode::getOpcode(), llvm::SDValue::getOperand(), llvm::SDNode::getOperand(), llvm::EVT::getSizeInBits(), llvm::SelectionDAG::getTargetLoweringInfo(), llvm::SDValue::getValueType(), llvm::SelectionDAG::getValueType(), llvm::SDNode::getValueType(), llvm::EVT::getVectorElementType(), llvm::EVT::getVectorNumElements(), llvm::SelectionDAG::getZeroExtendInReg(), llvm::ConstantSDNode::getZExtValue(), llvm::APInt::getZExtValue(), llvm::SDValue::hasOneUse(), llvm::AMDGPUSubtarget::hasSDWA(), llvm::Hi_32(), I, llvm::MVT::i32, llvm::MVT::i64, llvm::TargetLowering::DAGCombinerInfo::isBeforeLegalize(), llvm::TargetLowering::DAGCombinerInfo::isBeforeLegalizeOps(), llvm::EVT::isVector(), llvm::Lo_32(), llvm::ISD::LOAD, llvm::ISD::MUL, llvm::AMDGPUISD::MUL_I24, llvm::AMDGPUISD::MUL_LOHI_I24, llvm::AMDGPUISD::MUL_LOHI_U24, llvm::AMDGPUISD::MUL_U24, llvm::AMDGPUISD::MULHI_I24, llvm::AMDGPUISD::MULHI_U24, llvm::ISD::MULHS, llvm::ISD::MULHU, performAssertSZExtCombine(), performFAbsCombine(), performFNegCombine(), performLoadCombine(), performMulCombine(), performMulhsCombine(), performMulhuCombine(), performMulLoHi24Combine(), performRcpCombine(), performSelectCombine(), performShlCombine(), performSraCombine(), performSrlCombine(), performStoreCombine(), performTruncateCombine(), llvm::SmallVectorTemplateBase< T >::push_back(), llvm::AMDGPUISD::RCP, llvm::AMDGPUISD::RCP_IFLAG, llvm::ISD::SELECT, llvm::ISD::SHL, llvm::ISD::SIGN_EXTEND_INREG, Signed, simplifyI24(), llvm::ISD::SRA, llvm::ISD::SRL, llvm::ISD::STORE, llvm::ISD::TRUNCATE, and llvm::MVT::v2i32. Referenced by llvm::R600TargetLowering::PerformDAGCombine(), llvm::SITargetLowering::PerformDAGCombine(), and stripBitcast(). Definition at line 3867 of file AMDGPUISelLowering.cpp. References llvm::ISD::AND, assert(), llvm::TargetLowering::DAGCombinerInfo::DAG, llvm::ISD::FP16_TO_FP, llvm::SelectionDAG::getConstant(), llvm::SelectionDAG::getNode(), llvm::SDValue::getOpcode(), llvm::SDValue::getOperand(), llvm::SDNode::getOperand(), llvm::SDValue::getValueType(), llvm::SDNode::getValueType(), llvm::AMDGPUSubtarget::has16BitInsts(), and llvm::SDValue::hasOneUse(). Definition at line 3665 of file AMDGPUISelLowering.cpp. References allUsesHaveSourceMods(), llvm::TargetLowering::DAGCombinerInfo::DAG, llvm::ISD::FADD, llvm::ISD::FCANONICALIZE, llvm::ISD::FMA, llvm::ISD::FMAD, llvm::AMDGPUISD::FMAX_LEGACY, llvm::ISD::FMAXNUM, llvm::ISD::FMAXNUM_IEEE, llvm::AMDGPUISD::FMED3, llvm::AMDGPUISD::FMIN_LEGACY, llvm::ISD::FMINNUM, llvm::ISD::FMINNUM_IEEE, llvm::ISD::FMUL, llvm::AMDGPUISD::FMUL_LEGACY, llvm::ISD::FNEARBYINT, llvm::ISD::FNEG, fnegFoldsIntoOp(), llvm::ISD::FP16_TO_FP, llvm::ISD::FP_EXTEND, llvm::ISD::FP_ROUND, llvm::ISD::FRINT, llvm::ISD::FSIN, llvm::ISD::FTRUNC, llvm::SelectionDAG::getConstant(), llvm::SDNode::getFlags(), llvm::SDValue::getNode(), llvm::SelectionDAG::getNode(), llvm::SDValue::getOpcode(), llvm::SDValue::getOperand(), llvm::SDNode::getOperand(), llvm::SDValue::getValueType(), llvm::SDNode::getValueType(), llvm::SDValue::hasOneUse(), I, inverseMinMax(), isConstantCostlierToNegate(), mayIgnoreSignedZero(), llvm::AMDGPUISD::RCP, llvm::AMDGPUISD::RCP_IFLAG, llvm::AMDGPUISD::RCP_LEGACY, llvm::SelectionDAG::ReplaceAllUsesWith(), llvm::AMDGPUISD::SIN_HW, and llvm::ISD::XOR. Definition at line 2891 of file AMDGPUISelLowering.cpp. References llvm::AMDGPU::HSAMD::Kernel::Arg::Key::Align, llvm::TargetLoweringBase::allowsMisalignedMemoryAccesses(), llvm::ISD::BITCAST, llvm::TargetLowering::DAGCombinerInfo::CombineTo(), llvm::TargetLowering::DAGCombinerInfo::DAG, llvm::TargetLowering::expandUnalignedLoad(), llvm::MemSDNode::getAddressSpace(), llvm::MemSDNode::getAlignment(), llvm::LoadSDNode::getBasePtr(), llvm::MemSDNode::getChain(), llvm::SelectionDAG::getContext(), getEquivalentMemType(), llvm::SelectionDAG::getLoad(), llvm::MemSDNode::getMemOperand(), llvm::MemSDNode::getMemoryVT(), llvm::SelectionDAG::getMergeValues(), llvm::SelectionDAG::getNode(), llvm::EVT::getStoreSize(), llvm::SDValue::getValue(), hasVolatileUser(), llvm::TargetLowering::DAGCombinerInfo::isBeforeLegalize(), llvm::ISD::isNormalLoad(), llvm::TargetLoweringBase::isTypeLegal(), llvm::EVT::isVector(), llvm::MemSDNode::isVolatile(), N, llvm::TargetLowering::scalarizeVectorLoad(), shouldCombineMemoryType(), and Size. Definition at line 3306 of file AMDGPUISelLowering.cpp. References llvm::ISD::ANY_EXTEND, llvm::EVT::bitsLE(), llvm::TargetLowering::DAGCombinerInfo::DAG, getMul24(), llvm::SDValue::getOpcode(), llvm::SDValue::getOperand(), llvm::SDNode::getOperand(), llvm::EVT::getScalarType(), llvm::SelectionDAG::getSExtOrTrunc(), llvm::EVT::getSizeInBits(), llvm::SDNode::getValueType(), llvm::SelectionDAG::getZExtOrTrunc(), llvm::AMDGPUSubtarget::has16BitInsts(), llvm::AMDGPUSubtarget::hasMulI24(), llvm::AMDGPUSubtarget::hasMulU24(), llvm::MVT::i16, llvm::MVT::i32, isI24(), isU24(), llvm::EVT::isVector(), and Size. Definition at line 3353 of file AMDGPUISelLowering.cpp. References llvm::TargetLowering::DAGCombinerInfo::AddToWorklist(), llvm::TargetLowering::DAGCombinerInfo::DAG, llvm::SDValue::getNode(), llvm::SelectionDAG::getNode(), llvm::SDNode::getOperand(), llvm::SelectionDAG::getSExtOrTrunc(), llvm::SDNode::getValueType(), llvm::AMDGPUSubtarget::hasMulI24(), llvm::MVT::i32, isI24(), llvm::EVT::isVector(), and llvm::AMDGPUISD::MULHI_I24. Definition at line 3377 of file AMDGPUISelLowering.cpp. References llvm::TargetLowering::DAGCombinerInfo::AddToWorklist(), llvm::TargetLowering::DAGCombinerInfo::DAG, llvm::SDValue::getNode(), llvm::SelectionDAG::getNode(), llvm::SDNode::getOperand(), llvm::EVT::getSizeInBits(), llvm::SDNode::getValueType(), llvm::SelectionDAG::getZExtOrTrunc(), llvm::AMDGPUSubtarget::hasMulU24(), llvm::MVT::i32, isU24(), llvm::EVT::isVector(), and llvm::AMDGPUISD::MULHI_U24. Definition at line 3401 of file AMDGPUISelLowering.cpp. References llvm::TargetLowering::DAGCombinerInfo::DAG, llvm::SelectionDAG::getMergeValues(), llvm::SelectionDAG::getNode(), llvm::SDNode::getOpcode(), llvm::SDNode::getOperand(), llvm::MVT::i32, llvm::AMDGPUISD::MUL_I24, llvm::AMDGPUISD::MUL_LOHI_I24, llvm::AMDGPUISD::MUL_U24, llvm::AMDGPUISD::MULHI_I24, llvm::AMDGPUISD::MULHI_U24, Signed, and simplifyI24(). Definition at line 3892 of file AMDGPUISelLowering.cpp. References llvm::TargetLowering::DAGCombinerInfo::DAG, llvm::dyn_cast(), llvm::SelectionDAG::getConstantFP(), llvm::SDNode::getOperand(), llvm::APFloat::getSemantics(), and llvm::SDNode::getValueType(). Referenced by fp16SrcZerosHighBits(), and PerformDAGCombine(). Definition at line 3574 of file AMDGPUISelLowering.cpp. References combineFMinMaxLegacy(), llvm::TargetLowering::DAGCombinerInfo::DAG, llvm::MVT::f32, foldFreeOpFromSelect(), llvm::SelectionDAG::getNode(), llvm::SDValue::getOpcode(), llvm::SDValue::getOperand(), llvm::SDNode::getOperand(), llvm::SelectionDAG::getSetCC(), llvm::ISD::getSetCCInverse(), llvm::SDValue::getValueType(), llvm::SDNode::getValueType(), llvm::AMDGPUSubtarget::hasFminFmaxLegacy(), llvm::SDValue::hasOneUse(), llvm::SelectionDAG::isConstantValueOfAnyType(), llvm::EVT::isInteger(), performCtlz_CttzCombine(), llvm::ISD::SELECT, and llvm::ISD::SETCC. Definition at line 3045 of file AMDGPUISelLowering.cpp. References llvm::ISD::ANY_EXTEND, llvm::ISD::BITCAST, llvm::ISD::BUILD_VECTOR, llvm::SelectionDAG::computeKnownBits(), llvm::KnownBits::countMinLeadingZeros(), llvm::TargetLowering::DAGCombinerInfo::DAG, llvm::dyn_cast(), llvm::SelectionDAG::getBuildVector(), llvm::SelectionDAG::getConstant(), llvm::SelectionDAG::getNode(), llvm::SDNode::getOpcode(), llvm::SDNode::getOperand(), llvm::SDValue::getValueType(), llvm::SDNode::getValueType(), llvm::SelectionDAG::getZExtOrTrunc(), llvm::ConstantSDNode::getZExtValue(), llvm::MVT::i16, llvm::MVT::i32, llvm::MVT::i64, llvm::TargetLoweringBase::isOperationLegal(), llvm::MipsISD::Lo, llvm::ISD::SHL, llvm::ISD::SIGN_EXTEND, llvm::ISD::TRUNCATE, llvm::MVT::v2i16, llvm::MVT::v2i32, X, and llvm::ISD::ZERO_EXTEND. Definition at line 3113 of file AMDGPUISelLowering.cpp. References llvm::ISD::BITCAST, llvm::TargetLowering::DAGCombinerInfo::DAG, llvm::dyn_cast(), llvm::SelectionDAG::getBuildVector(), llvm::SelectionDAG::getConstant(), getHiHalf64(), llvm::SelectionDAG::getNode(), llvm::SDNode::getOperand(), llvm::SDNode::getValueType(), llvm::ConstantSDNode::getZExtValue(), llvm::MipsISD::Hi, llvm::MVT::i32, llvm::MVT::i64, llvm::ISD::SRA, and llvm::MVT::v2i32. Definition at line 3148 of file AMDGPUISelLowering.cpp. References llvm::ISD::AND, llvm::ISD::BITCAST, llvm::TargetLowering::DAGCombinerInfo::DAG, llvm::dyn_cast(), llvm::ISD::EXTRACT_VECTOR_ELT, llvm::SelectionDAG::getBuildVector(), llvm::SelectionDAG::getConstant(), llvm::SelectionDAG::getNode(), llvm::SDValue::getOpcode(), llvm::SDValue::getOperand(), llvm::SDNode::getOperand(), llvm::SDNode::getValueType(), llvm::MipsISD::Hi, llvm::MVT::i32, llvm::MVT::i64, llvm::BitmaskEnumDetail::Mask(), llvm::ISD::SRL, and llvm::MVT::v2i32. Definition at line 2942 of file AMDGPUISelLowering.cpp. References llvm::AMDGPU::HSAMD::Kernel::Arg::Key::Align, llvm::TargetLoweringBase::allowsMisalignedMemoryAccesses(), llvm::ISD::BITCAST, llvm::TargetLowering::DAGCombinerInfo::DAG, llvm::TargetLowering::expandUnalignedStore(), llvm::MemSDNode::getAddressSpace(), llvm::MemSDNode::getAlignment(), llvm::StoreSDNode::getBasePtr(), llvm::MemSDNode::getChain(), llvm::SelectionDAG::getContext(), getEquivalentMemType(), llvm::MemSDNode::getMemOperand(), llvm::MemSDNode::getMemoryVT(), llvm::SelectionDAG::getNode(), llvm::SelectionDAG::getStore(), llvm::EVT::getStoreSize(), llvm::StoreSDNode::getValue(), llvm::SDValue::hasOneUse(), llvm::TargetLowering::DAGCombinerInfo::isBeforeLegalize(), llvm::ISD::isNormalStore(), llvm::TargetLoweringBase::isTypeLegal(), llvm::EVT::isVector(), llvm::MemSDNode::isVolatile(), N, llvm::SelectionDAG::ReplaceAllUsesOfValueWith(), llvm::TargetLowering::scalarizeVectorStore(), shouldCombineMemoryType(), and Size. Definition at line 3197 of file AMDGPUISelLowering.cpp. References llvm::TargetLowering::DAGCombinerInfo::AddToWorklist(), llvm::ISD::BITCAST, llvm::ISD::BUILD_VECTOR, llvm::EVT::changeTypeToInteger(), llvm::SelectionDAG::computeKnownBits(), llvm::KnownBits::countMinLeadingZeros(), llvm::TargetLowering::DAGCombinerInfo::DAG, llvm::KnownBits::getBitWidth(), llvm::KnownBits::getConstant(), llvm::SelectionDAG::getContext(), llvm::SelectionDAG::getDataLayout(), llvm::SDValue::getNode(), llvm::SelectionDAG::getNode(), llvm::SDValue::getOpcode(), llvm::SDValue::getOperand(), llvm::SDNode::getOperand(), llvm::EVT::getScalarSizeInBits(), llvm::TargetLoweringBase::getShiftAmountTy(), llvm::EVT::getSizeInBits(), llvm::SDValue::getValueType(), llvm::SDNode::getValueType(), llvm::EVT::getVectorNumElements(), llvm::EVT::getVectorVT(), llvm::SelectionDAG::getZExtOrTrunc(), llvm::MVT::i32, llvm::KnownBits::isConstant(), llvm::isConstOrConstSplat(), llvm::EVT::isFloatingPoint(), llvm::EVT::isVector(), llvm::Log2_32(), llvm::ISD::SHL, Size, llvm::ISD::SRA, llvm::ISD::SRL, stripBitcast(), llvm::ISD::TRUNCATE, and llvm::APInt::ule(). Definition at line 1204 of file AMDGPUISelLowering.cpp. Referenced by llvm::R600TargetLowering::ReplaceNodeResults(), and stripBitcast(). Definition at line 2870 of file AMDGPUISelLowering.cpp. References llvm::EVT::getScalarType(), llvm::EVT::getStoreSize(), llvm::MVT::i32, llvm::EVT::isByteSized(), llvm::TargetLoweringBase::isTypeLegal(), llvm::EVT::isVector(), and Size. Referenced by performLoadCombine(), and performStoreCombine(). Returns how the IR-level AtomicExpand pass should expand the given AtomicRMW, if at all. Default is to never expand. Definition at line 4673 of file AMDGPUISelLowering.cpp. References llvm::TargetLoweringBase::CmpXChg, llvm::AtomicRMWInst::FAdd, llvm::AtomicRMWInst::FSub, llvm::AtomicRMWInst::getOperation(), llvm::AtomicRMWInst::Nand, and llvm::TargetLoweringBase::None. Referenced by getFenceOperandTy(), and llvm::SITargetLowering::shouldExpandAtomicRMWInIR(). Definition at line 681 of file AMDGPUISelLowering.cpp. References AMDGPUAS::CONSTANT_ADDRESS, AMDGPUAS::CONSTANT_ADDRESS_32BIT, llvm::MemSDNode::getAddressSpace(), getAlignment(), llvm::MemSDNode::getMemOperand(), llvm::EVT::getStoreSizeInBits(), llvm::SDNode::getValueType(), AMDGPUAS::GLOBAL_ADDRESS, llvm::MemSDNode::isInvariant(), llvm::AMDGPUInstrInfo::isUniformMMO(), N, and llvm::TargetLoweringBase::shouldReduceLoadWidth(). If true, then instruction selection should seek to shrink the FP constant of the specified type to a smaller type in order to save space and / or reduce runtime. Definition at line 676 of file AMDGPUISelLowering.cpp. References llvm::MVT::f32, llvm::MVT::f64, and llvm::EVT::getScalarType(). Definition at line 1371 of file AMDGPUISelLowering.cpp. References llvm::ISD::BITCAST, llvm::ISD::EXTRACT_VECTOR_ELT, llvm::SelectionDAG::getConstant(), llvm::SelectionDAG::getNode(), llvm::MipsISD::Hi, llvm::MVT::i32, llvm::MipsISD::Lo, and llvm::MVT::v2i32. Referenced by getPermuteMask(), and splitBinaryBitConstantOpImpl(). Split the 64-bit value LHS into two 32-bit components, and perform the binary operation Opc to it with the corresponding constant operands. Definition at line 3022 of file AMDGPUISelLowering.cpp. References llvm::TargetLowering::DAGCombinerInfo::AddToWorklist(), llvm::ISD::BITCAST, llvm::TargetLowering::DAGCombinerInfo::DAG, llvm::SelectionDAG::getBuildVector(), llvm::SelectionDAG::getConstant(), llvm::SDValue::getNode(), llvm::SelectionDAG::getNode(), llvm::MipsISD::Hi, llvm::MVT::i32, llvm::MVT::i64, llvm::MipsISD::Lo, split64BitValue(), and llvm::MVT::v2i32. Definition at line 1420 of file AMDGPUISelLowering.cpp. References assert(), llvm::ISD::EXTRACT_SUBVECTOR, llvm::ISD::EXTRACT_VECTOR_ELT, llvm::SelectionDAG::getConstant(), llvm::SelectionDAG::getDataLayout(), llvm::SelectionDAG::getNode(), llvm::SDValue::getValueType(), getVectorIdxTy(), llvm::EVT::getVectorNumElements(), llvm::MipsISD::Hi, llvm::EVT::isVector(), llvm::MipsISD::Lo, and N.
Definition at line 1436 of file AMDGPUISelLowering.cpp. References llvm::ISD::CONCAT_VECTORS, llvm::MemSDNode::getAlignment(), llvm::LoadSDNode::getBasePtr(), llvm::MemSDNode::getChain(), llvm::SelectionDAG::getConstant(), llvm::SelectionDAG::getDataLayout(), llvm::LoadSDNode::getExtensionType(), llvm::SelectionDAG::getExtLoad(), llvm::MachineMemOperand::getFlags(), llvm::MemSDNode::getMemOperand(), llvm::MemSDNode::getMemoryVT(), llvm::SelectionDAG::getMergeValues(), llvm::SelectionDAG::getNode(), llvm::SelectionDAG::getObjectPtrOffset(), llvm::MachineMemOperand::getPointerInfo(), getSplitDestVTs(), llvm::EVT::getStoreSize(), llvm::SelectionDAG::getUNDEF(), llvm::SDValue::getValue(), llvm::SDValue::getValueType(), getVectorIdxTy(), llvm::MipsISD::Hi, llvm::ISD::INSERT_SUBVECTOR, llvm::ISD::INSERT_VECTOR_ELT, llvm::MipsISD::Lo, llvm::SPII::Load, llvm::MinAlign(), llvm::MVT::Other, llvm::TargetLowering::scalarizeVectorLoad(), Size, splitVector(), and llvm::ISD::TokenFactor. Definition at line 1520 of file AMDGPUISelLowering.cpp. References llvm::MemSDNode::getAlignment(), llvm::StoreSDNode::getBasePtr(), llvm::MemSDNode::getChain(), llvm::MachineMemOperand::getFlags(), llvm::MemSDNode::getMemOperand(), llvm::MemSDNode::getMemoryVT(), llvm::SelectionDAG::getNode(), llvm::SelectionDAG::getObjectPtrOffset(), llvm::MachineMemOperand::getPointerInfo(), getSplitDestVTs(), llvm::EVT::getStoreSize(), llvm::SelectionDAG::getTruncStore(), llvm::StoreSDNode::getValue(), llvm::EVT::getVectorNumElements(), llvm::MachinePointerInfo::getWithOffset(), llvm::MipsISD::Hi, llvm::MipsISD::Lo, llvm::MinAlign(), llvm::MVT::Other, llvm::TargetLowering::scalarizeVectorStore(), Size, splitVector(), llvm::SPII::Store, and llvm::ISD::TokenFactor. Return true if it is expected to be cheaper to do a store of a non-zero vector constant with the given size and type for the address space than to store the individual scalar element constants. Definition at line 796 of file AMDGPUISelLowering.cpp. Definition at line 4156 of file AMDGPUISelLowering.cpp. References llvm::SelectionDAG::getConstant(), llvm::SelectionDAG::getMachineFunction(), llvm::MachinePointerInfo::getStack(), llvm::SelectionDAG::getStore(), llvm::MVT::i32, llvm::MachineMemOperand::MODereferenceable, and llvm::SPII::Store. Referenced by CreateLiveInRegisterRaw(), and llvm::SITargetLowering::passSpecialInputs(). Definition at line 158 of file AMDGPUISelLowering.h. References addTokenForArgument(), aggressivelyPreferBuildVectorSources(), allUsesHaveSourceMods(), llvm::ISD::BITCAST, CCAssignFnForCall(), CCAssignFnForReturn(), combineFMinMaxLegacy(), llvm::SDValue::getOpcode(), llvm::SDValue::getOperand(), getTargetNodeName(), getVectorIdxTy(), isCheapToSpeculateCtlz(), isCheapToSpeculateCttz(), isFAbsFree(), isFNegFree(), isFPImmLegal(), isLoadBitCastBeneficial(), isNarrowingProfitable(), isSDNodeAlwaysUniform(), isSelectSupported(), isTruncateFree(), isZExtFree(), llvm::SPII::Load, LowerCall(), LowerDYNAMIC_STACKALLOC(), LowerOperation(), LowerReturn(), lowerUnhandledCall(), PerformDAGCombine(), ReplaceNodeResults(), shouldReduceLoadWidth(), ShouldShrinkFPConstant(), and storeOfVectorConstantIsCheap(). Definition at line 1495 of file AMDGPUISelLowering.cpp. References assert(), llvm::ISD::EXTRACT_SUBVECTOR, llvm::MemSDNode::getAlignment(), llvm::LoadSDNode::getBasePtr(), llvm::MemSDNode::getChain(), llvm::SelectionDAG::getConstant(), llvm::SelectionDAG::getContext(), llvm::SelectionDAG::getDataLayout(), llvm::LoadSDNode::getExtensionType(), llvm::SelectionDAG::getExtLoad(), llvm::MachineMemOperand::getFlags(), llvm::MemSDNode::getMemOperand(), llvm::MemSDNode::getMemoryVT(), llvm::SelectionDAG::getMergeValues(), llvm::SelectionDAG::getNode(), llvm::MachineMemOperand::getPointerInfo(), llvm::SDValue::getValue(), llvm::SDValue::getValueType(), llvm::EVT::getVectorElementType(), getVectorIdxTy(), llvm::EVT::getVectorVT(), and llvm::SPII::Load.